Some 100 Catholic educators met at Boston College September 26–28 to consider models for improving the quality and sustainability of elementary and secondary Catholic education. 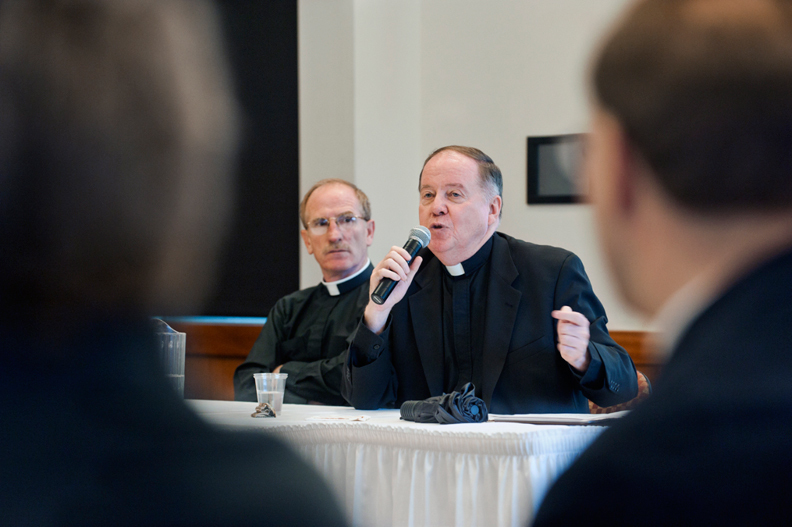 The third in a projected series of six Catholic Higher Education Collaborative conferences, the event was cosponsored by the Roche Center for Catholic Education at Boston College’s Lynch School of Education and Fordham University’s Center for Catholic Leadership and Faith-Based Education. Titled “Catholic Schools as Schools of Academic Excellence: How Can Catholic Higher Education Help?” the meeting addressed challenges that include declining enrollment, rising costs, and what Patricia Weitzel-O’Neill, executive director of the Roche Center, has described as a lack of systemic collaboration among schools. On the second day of the gathering, Boston College president William P. Leahy, SJ, (right) and Joseph McShane, SJ,’72, president of Fordham University, spoke in the Murray Room about ways higher education institutions can assist K-12 programs with marketing, curriculum development, and strategic planning. This feature was posted on Thursday, September 30, 2010 and is filed under Featured Photo.